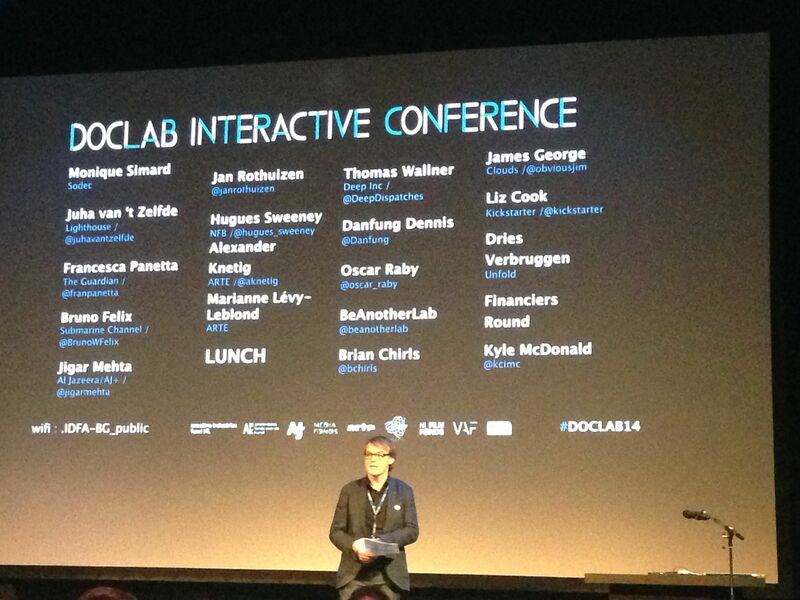 Last year, DocLab had “Interactive reality” in its title, this year it was “Immersive reality”. 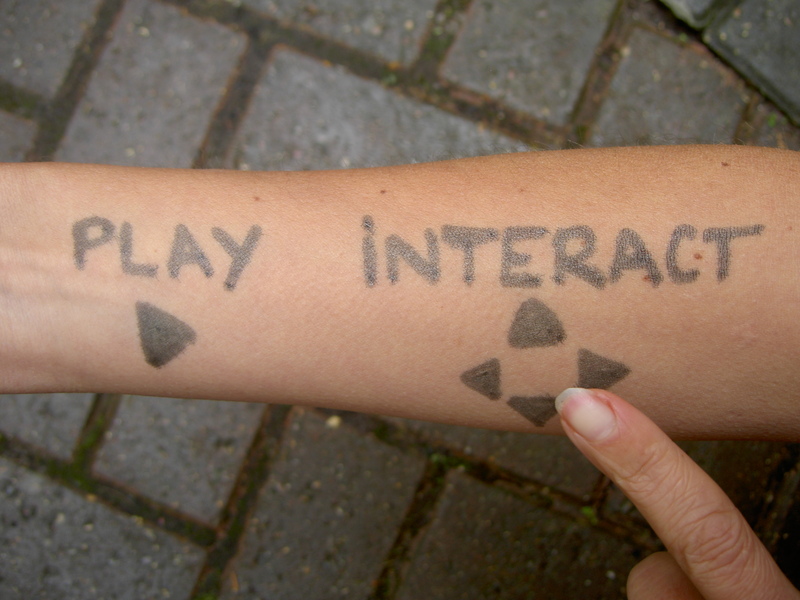 We shifted from interactive to immersive, what does this mean? Since our physical reality is already both immersive and interactive, I suppose the novelty here is to question how we want to understand the role of factual storytelling in the digital age tout court, especially now that 3D and VR are becoming an option through the affordable Oculus Rift technology…. are digital and physical reality starting to merge in the documentary genre? This year there were 14 web projects in competition (browse them all yourself here), of which one was a 360 degrees documentary (Polar sea 360) and the others were a mix of established names (Seven Deadly Sins produced by The Guardian and NFB and Primal, NFB) and a mix of apps and interesting art web experiments (Somebody, I know where your cat lives, Thru you too). But what everybody was talking about, and what people were queuing to see in the exhibition space of De Brakke Grond, were the 6 VR pieces showcasing the first attempts to document reality with 3D technologies. There was a mix of 360 degrees immersive cinema (Polar sea 360, Strangers with Patrick Watson and Zero point) and of computer generated graphics (Clouds and Assent) plus an intriguing installation were two people could exchange the perception of their body (A machine to be another). A new technology is obviously entering the world of storytelling, and with it comes the question of what documentarians might want to do with it… what can be gained by feeling “inside” the shot as opposed to behind the camera? Is immersion opening new doors to storytelling or are we back into the old photo versus painting and film versus photo debate? Since your Oculus Rift headset allows you to browse a scene in 360 degrees by just turning your head, you feel like you are there – although you cannot move inside that space, which I felt was very disturbing (you can move in space if you use a much more complicated and expensive technology, like the one used by Nonny De la Pena). So… what are we gaining by becoming inside observers with zero agency? And even when, in some of the projects, one could click on an option by sustaining the glance on one point (effectively using your eye position as a click) is this what agency is all about? Sustain the glance to move next? Sometimes I felt as the wow effect of the new visual technology was obfuscating my senses, limiting my options, and bringing me back to a point and click navigation in what was effectively a branching narrative… and then sometimes (like in Clouds, Assent and A Machine to be another) I could sense that this is the beginning of a whole new language, and probably of the positioning of the self in a “what if reality”. The whole area of “presence” in documentary fascinates me, and presence in a “what if reality” could bring us very far… or maybe not. Although VR was the hip technological novelty of the year, DocLab’s curator Caspar Sonnen has wisely differentiated its offer this year, by creating a one day conference, and several live events, that did put the emphasis on other trends too. The ones that resonated with me are the following: 1. finance, where is the money? 2. digital artists, rather than documentarians, are often driving innovation in the factual sector, and 3. digital safety/hybridity/presence (who are we becoming in this hybrid physical/digital world?). The importance of artists in challenging genres and experimenting with new technologies is a fact (at least for me). But I found interesting that some of the projects in competition, and several of the speakers at the conference, where clearly coming from the digital art scene, rather than the documentarist or journalist one. Does this mean that Sonnen’s curational eye wanted to balance the interactive factual output between “established” and experimental projects? Or does it mean that this year, more than in others, digital artists are embracing factual subjects? Clearly, when artist-coder Owen Mundy creates a website that uses photos of cats and geotags them on maps, he is not simply doing it for the love of felines, but rather to demonstrate how easy it is to collect data by using publicly accessible databanks and to draw conclusions on individual privacy and global access to smart phones. Ironically, if the project had been called I Know Where You Live, rather than I Know Where Your Cat Lives, people would have been scared rather than amused… and this is why this project is featured at DocLab, because it speaks of data privacy. Similarly, the intervention of James George (CLOUDS) was questioning what will be the role of the camera of the future – when more than being a snapshots a photo becomes a searchable database… This is a question that is particularly relevant in the age of Google Glasses and geotagged photos, but it was also what inspired James George to create DepthKit (a depth sensing camera that links a Microsoft Kinect or Asus Xtion Pro to your HD DSLR camera), a devise that is at the heart of the pixellated ghostly aesthetics of CLOUDS. Finally Kyle McDonald, another genious artist-coder, gave a retrospective of his disrupting hacking work. Among all his work I noted the following projects: People staring at computers (2011) where he hacked an Apple store and recorded people staring at their computer, Social Roulette (2013) a fake game where you have 1 in 6 chances of deleting your Facebook, and Going public (2013) a one month Twitter performance where anybody could take his Twitter identity. 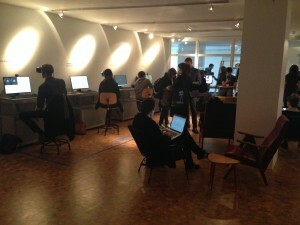 All of these projects highlight, once again, the fragility of our relationship with our digital identity, and the insecurity of the space that moderates our physical/digital existence… All of which leads me softly, to the last theme I spotted in this year’s DocLab: digital safety/hybridity/presence. 3. Who are we becoming in this hybrid physical/digital world? Two important projects were rotating around this new area of uncertainty: digital privacy, digital tracking and digital memory. During a live talk on Saturday 22nd, Upian and Brett Gaylor shared their first episode of Do Not Track – due to be released in March 2015. Eight webdocs will be progressively released to engage us into what effectively is a personalized narrative around who is tracking us on the Web. While Brett is speaking to us about what he does with his computer and his browsing habits, we are asked about our own habits, and this information is collected to show us live what our trackers know about us… This is going to be a great project for sure, and an interesting breed between education, documentation and interactive narrative. Antoine Viviani, the creator of In Situ (2011), was presenting his new collaboration with Arte, In Limbo, due to be released in early 2015. In a personal and easy-to-follow way, In Limbo clearly demonstrates how our daily lives are becoming enmeshed with the Internet. While watching the film itself, the viewer can see his own details gathered from Facebook, Twitter or Instagram being mixed into the narrative. GPS-based Street View, YouTube collages of previously watched films and photo compilations from personal albums appear in the narrative of the movie, making it disturbingly personalized.